Happy New Year! I’m so excited and can not wait to start our new adventures in skating together in the coming days. To my new students, welcome!… and to my dedicated old students, welcome back! I thought this would be a good opportunity to review some basic important skating tips so you can get the very most out of every lesson. You can obtain more detailed information on each of these tips in my prior blog posts and/or use my quick one-page reference sheet, My Essential Skating Tips for Beginners. Ideally, it would be helpful if you can arrive at least 15-20 minutes early so you can give yourself (your skater) enough time to check-in at registration or with your instructor, rent skates, get skates on, and warm-up before getting on the ice. Please dress warmly! Wear plenty of layers because it will get warm once you start moving around. Make sure your clothes are close-fitting but also provides ability for you to move freely. Don’t forget your gloves or mittens! You think they’re to keep your hands warm but actually they’re also to protect your hands when you fall (and you definitely will be falling a lot in the beginning). Remember, your skate size does not have to necessarily match your shoe size. As long as your skates fit comfortably and snug then you are all set- your feet, particularly your heel, should not be moving around inside the skates once they are properly laced up. However, your toes should have some wiggle room. The rule of thumb is that the closer the fit, the more control you have with your skates. You should also wear thin and lightweight socks because thick socks actually causes bumps inside your boots and you won’t be comfortable. Lastly, enjoy your time on the ice and don’t feel pressured to learn and master all the skills during one lesson. 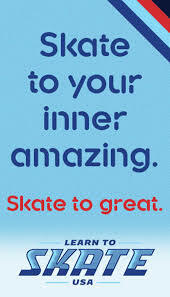 Be patient because even though anyone at any age and skill level can learn to skate, it still does take much practice. In fact, after every lesson, I highly recommend you spending at least half hour on the ice to practice and review the skills you learned. Don’t stay on the ice to talk to friends or skate around in circles- I want you to make the most of your time and be productive so come to me and ask what elements you should be working on because practice makes perfect! Looking forward to getting to know you all and excited to working with you to become future great skaters! Older PostCONGRATS to my Learn-to-Skate Students!